These are the final strips in my series about Becky and her friends. Our little girl has grown up but still loves to pull faces for the camera. And hasn’t she nabbed herself a gorgeous boyfriend? I wonder where Becky is now? What is the story behind the photos? How did this brilliant series of souvenirs of a seemingly happy child’s formative years, come to be in the public domain? I wish I knew Becky’s surname so that I could find her, but maybe her friend Pam Meadow will Google herself one day, discover these pictures and be able to tell us more of the life behind this archive. Undated. With unidentified friend or sibling. Could this be Robin? Same unidentified friend and a new one. In part one I mentioned Robin, who could be a sibling or friend of Becky’s. The shots where he was named were missing from the archive of photos. This group of shots, all of the same, unnamed boy, suggest a younger brother or cousin, possibly named Robin. In the strip with Becky, our happy, gap-toothed lad seems to be recovering from a fall or fight, having a large scab on his top lip. Fully healed in the second strip, his tousled hair and face-making skills are featured. Finally, in the third strip he is joined by a little girl, who could also be a cousin to Becky, but I don’t think she is likely to be her sister. They are trying their best to pull faces, but seem unable to match their efforts to the timing of the flashes. 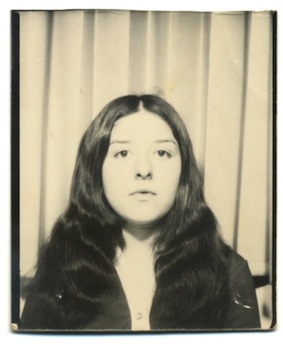 All undated photos, the top ones of Becky are probably from 1972 when she was about 17 years old, making the other strips more or less of the same date. Here is Becky and a new friend, once again having fun showing off in a photobooth, bless ’em. I am guessing that this photo was taken quite soon after the picture, dated April 1969, from the previous post in this series. Becky would therefore be around 14 years old in this strip. Becky’s pal either has bad teeth or braces. It is too hard to tell which, even with the ability to enlarge pictures with the scanner. I am going for bad teeth, as when I had braces, chewing-gum, (seen being chomped with gusto in the second frame of this strip), was an utter nightmare if it became attached to the wires. Here we find Becky and her friend or possibly sister, Tina. The notes on the back indicate that Becky was in eighth grade when this was taken and Tina was in the seventh. Tina rivals Becky in the stupid face pulling schenanigans. Quasimodo comes to mind in the last two photos! Undated. With unidentified friend or sibling. These are the first three strips of photos from 14 strips that came from the USA as one lot. They document the changing face and life of a girl called Becky over a period of 10 or more years. Becky loves to pull a face and muck about in photobooths with her friends and family. In some pictures her hair is straightened; in others wild and curly. You will enjoy getting to know her and watching her growth into adulthood. The top two strips are undated but the lower has written on the back “Me and Robin, probably in the summer of 1968. I can’t remember exactly when.” The photos of Robin are missing. Robin, being the male spelling of the name, is possibly a younger brother who appears in future photos. From information on other photos in the series I have worked out that Becky was about 13 years old when the third strip of pictures was taken. I guess she was two years younger in the first set and a year or so younger in the second.